THIS DRESS HAS SOLD. CONTACT SALES@BRIDESFORACAUSE.COM WITH DRESS INQUIRIES. 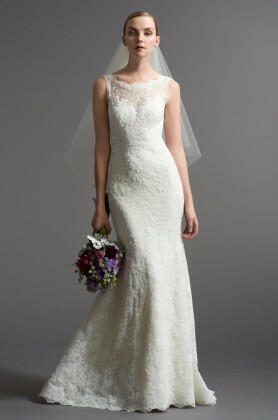 This dress encompasses all of the beautiful elements of a classic bride! This lovely fit and flare wedding dress is crafted from luxurious lace fabric that features delicate embroidered appliques throughout and is simply stunning as it falls down the full length of the dress. The strapless sweetheart neckline is feminine and fun, creating the perfect balance to the sleek fitted bodice with its figure flattering natural waistline. The back of this gown is kept classic with a slight V cut backline and covered buttons down the length of the dress. Tiered layers of lace add interest to the backside of the skirt as they transition perfectly into a full length hemline. This dress is used and in great condition! It was originally a size 14, which has been altered to fit more like a 12. A beaded belt is included. We just got it dry cleaned and it looks brand new! While the photo for this dress features a champagne color, the one we have for sale is ivory.